This tutorial is about single beam DAM2 but will adapt very well to multibeam DAM5. ##  "metadata.csv"  "Monitor11.txt" "Monitor14.txt" "Monitor64.txt"
Have one folder per “experiment”. 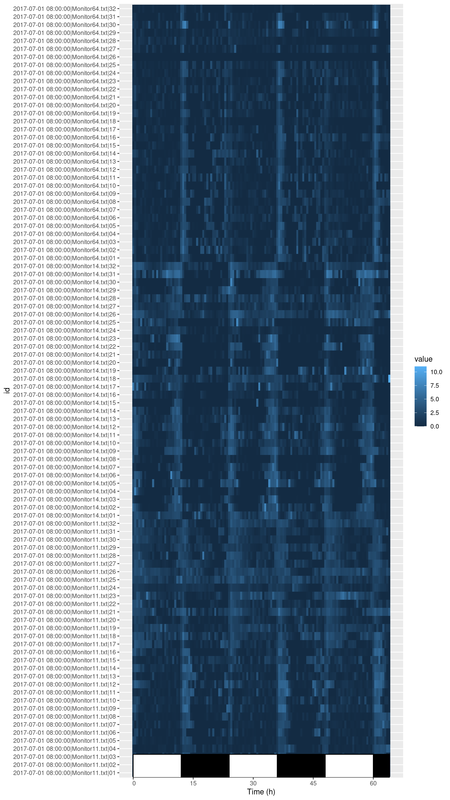 That is a folder that contains one metadata file, your R scripts, your figures regarding a set of consistent experiment. Linking is the one necessary step before loading the data. It allocates a unique identifier to each animal. As result_dir, we just use the directory where the data lives, which you decided when you extracted your data (DATA_DIR). Importantly, you do not need to cut the relevant parts of your DAM files (this is an error-prone step that should be avoided). In other words, no need to use the DAMFileScan utility or manipulate in any way the original data. You can keep all the data in one file per monitor. rethomics will use start and stop datetime to find the appropriate part directly from your metadata. That is it, all our data is loaded in dt. In the circadian and sleep field, we need to align our data to a reference time of the day. Typically, when the light (would) turn on (ZT0). In damr, the time part of the start_datetime is used as a circadian reference. For instance, if you specify, in your metadata file 2017-01-01 09:00:00, you imply that ZT0 is at 09:00:00. The time is looked-up in the DAM file, so it will be at on same time zone settings as the computer that recorded the data. When fetching some data, date and time are always inclusive. For instance, start_date = 2017-01-01 and stop_date = 2017-01-01 retrieves all the data from the first of January 2017. Immediatly after loading your data, it is a good idea to visualise it, in order to detect anomalies or at least to be sure that everything looks ok. We can use ggetho for that, for example the following code will create an activity tile plot, useful to detect dead animals. What does this tile plot tell us? Each row is an animal (and is labelled with its corresponding id). Each column is a 30min window. The colour intensity indicates the activity. For most animals, the activity is rhythmic and synchronised with the light phase transisitions. Some animals are dead or missing. For instance take a look at channel 26 in Monitor64.txt. In other chapters, we will learn how to group individuals, visualise and compute statistics. We suggest to exclude animals a priori (e.g. because they died) by recording them as dead in the metadata. This way data is not modified or omited and can easily be recovered if needed. For instance, you can add a column status in your metadata file and put a default value such as "OK". If an animal is to be removed, you can replace "OK" by a reason (e.g. "dead", "escaped", …). Then, you can load your data without those animals load_dam_data(metadata[status == "OK"], ...). This practice has the advantage of making it very transparent, why some individuals where excluded. Also, as stated before, it can easily be reversed. Finaly, we may want to apply a function on the data as it is loaded, in order to preprocess it, saving time. This pre-processing will annotate the data, i.e create new information (new columns) based on the original data. As an example, we can perform a sleep (bouts of immobility of 5 min or more), from our sleepr package (which you will have installed). As you can see, we now have additional columns in the data.